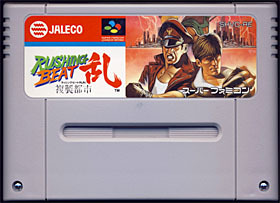 Rushing Beat Ran is a side-scrolling beat'em up by Jaleco and is the second episode of an exclusive trilogy for the Super Famicom system. The player can select two fighters from a list of five - two strong and large guys, two average fighters (a guys and a girl) and finally a fast Ninja (would a fighting game be complete without a Ninja ?). The remaining three are at the center of the story and get kidnapped by the evil Dieter and his secret army. The goal of the game is to rescue them before they are brainwashed and join the evil gang - each freed fighter joins the team and becomes a playable character. 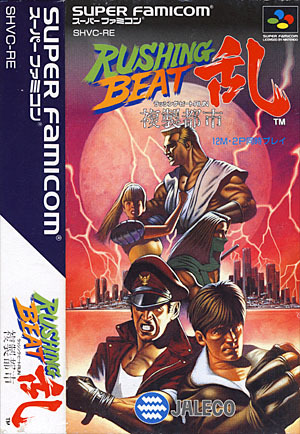 Rushing Beat Ran is a classical fighting game and plays much like other similar beat'em ups of the time such as Capcom's Final Fight or Sega's Street Of Rage. Our heroes can kick, punch and jump. They can also use a large arsenal of weaponry such as iron pipes, rocks, knives, baseball bats and even guns. Snacks and soda cans can be collected to gain some l ife back and, interestingly, can also be thrown at the enemies and inflict some (small) damage on their own. As expected, each fighter can also trigger a more powerful attack in exchange of some of his precious life. Characters can also slowly power-up and trigger more powerful throws when at full charge. A two co-op player mode is available. The American version of the game, called Brawl Brothers, was slightly modified - 'maze-like' stages were inserted here and there. Actually, these stages exist in the Japanese version but without the 'find the right doorway' concept. This makes some of the areas a lot more difficult than they initially were as most of the passageways lead the player back to the beginning of the stage. All the character names were also changed. DOUBLE TROUBLE STREET FIGHTING ACTION ! Fists and feet fly as the Brawl Brothers(TM) hit the streets in this explosive two player simultaneous fighting game. Score with the thunderous action of body slams, leg sweeps, jabs, hooks uppercuts, punching, kicking and more. Defeat the enemy and take over his role. Brawl Brothers(TM) features 10 realistic stages and three levels of difficulty. Blow-by-blow, Brawl Brothers(TM) packs a tremendous punch of realistic action. Take your best shot now! The Japanese version of the game can be unlocked from the American version. At the title sequence, when the Jaleco logo appears, press B, A, X and Y. A chime should sound to indicate that the Japanese version was unlocked. At the option screen, the Japanese title will appear in the background and a menu should now allow you to select the Japanese game. Rushing Beat Ran is a solid beat'em up and the game really shines with its simplistic controls and intuitive design. If you are a beat'em up fan, then you'll feel right at home. Despite a couple of flaws that I find somehow unfair (some bosses, for instance, tend to 'magically avoid' most of your punches...), the game offers some intense and great fighting moments, especially during the two-players co-op mode. It also gives five fighters to choose from which was quite unusual for the time (most fighting games didn't have more that three playable characters back then). Each fighter is also well designed and uses different fighting styles - for instance the Ninja is fast and uses airborne attacks whereas Lord J is slow and uses Judo throws. All in all, Rushing Beat Ran has a nice variety of stages and enemies, and it really stands out of the beat'em up crowd. I personally prefer the Japanese version, the maze-like stages from the American version really slow down the pace of the game. But the Japanese version is unlockable from the American version, so it may end up being a better choice, as you actually end up with two games in one.